SUMMARY: After attending the funeral of her estranged friend Skip in Knoxville, Tennessee, Vrai (short for Vraiment), a forty-something art history librarian with sons of her own, rescues ten-year-old Jonathan, who has been abandoned in the funeral home parking lot. The Blizzard of 1993 strands this unlikely duo at the Smoky View Motel, where they join forces in a very personal search for justice, eventually confronting the tyrant responsible for two deaths. 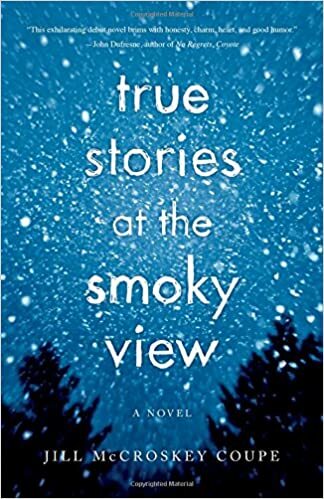 Containing elements of mystery and intrigue, True Stories at the Smoky View is a literary novel about family, friendship, tyranny, and the elusiveness of justice. For Vrai and Jonathan, it’s a story of mutual rescue, resulting in new lives for them both. THE BACK STORY: My life was in turmoil when I began this novel, back in 1995, and although I had nearly all my characters then, it took me a while to figure out exactly what the story was. Discouraged, I put this novel aside and began another one, which I took to several writers’ conferences. The feedback I received for that novel made me realize what this novel needed: more pages, more story, a satisfying ending. WHY THIS TITLE: I’ve taken several workshops from John Dufresne, whose guide to writing fiction is titled The Lie That Tells a Truth. At the Smoky View Motel, Vrai and Jonathan come across some short stories on Skip’s computer. These stories hint at the identity of the culprit responsible for Skip’s death. WHY SOMEONE WOULD WANT TO READ IT: Readers have told me it kept them guessing. And that Jonathan, whose parents were assassinated by Pinochet’s henchmen, is an especially memorable character. It’s also a book about a librarian, written by librarian, and may I say that Vrai hardly fits the stereotype? AUTHOR PROFILE: Jill Coupe’s first job was gathering (collating) in her father’s printing plant in Knoxville, Tennessee, in the foothills of the Great Smoky Mountains. A former librarian at Johns Hopkins University, she has an MFA in Fiction from Warren Wilson College, in the heart of the Blue Ridge. The Southern Appalachians always feel like home to her, but so does Baltimore, where she’s hard at work on her next novel. LOCAL OUTLETS: Available in libraries and wherever books are sold. If a library or bookstore doesn’t have it, they can order it. PRICE: In most bookstores: $16.95; on Amazon: $10.67; for Kindle: $8.69. Also at Barnes & Noble, Books-A-Million, etc.